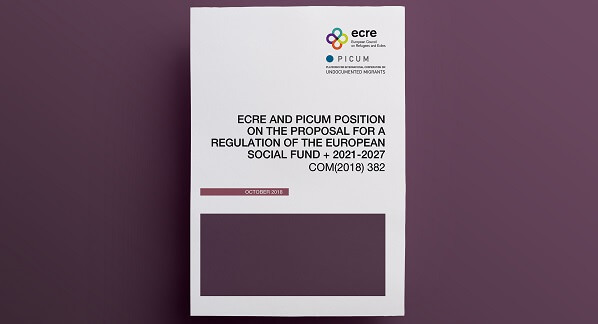 In the scope of a joint project on influencing EU funding for refugees and migrants’ inclusion, ECRE and PICUM have recently published their joint comments on the European Commission’s Proposal on the European Social Fund Plus (ESF+), currently being negotiated as part of the legislative proposals for the next EU Multiannual Financial Framework (MFF) 2021- 2027. The proposal for the ESF+ builds on the experiences of the current financial period, and aims at grouping those funds, which aims at implementing employment and social affairs policies, in one instrument, to better deliver the objectives of the European Pillar of Social Rights. Putting together more funding instruments is meant to simplify the administrative burden for managing authorities and applicants, as well as to improve synergies among different actions to better implement employment and social goals. Although the ESF is currently employed in a number of member states for the integration of third country nationals, from the next MFF, it will directly include among its objectives the long-term integration of third country nationals. Early-integration measures will be financed through the Asylum and Migration Fund (AMF). ECRE and PICUM are generally positive about transferring third country nationals’ integration from AMF to the ESF+, as this choice marks a step towards the inclusion of migrants into mainstream social inclusion, education and labour integration policies. However, the lack of any ring-fencing of resources to the inclusion of third country nationals is a real concern, which risks to provoke minimal allocation by those member states that do not prioritise third country nationals’ inclusion. Moreover, splitting up integration between long-term and early measures risks undermining the inclusion of newcomers – and in particular asylum seekers – in activities aiming at training and including people in the labour market. A meaningful cooperation between managing authorities of ESF+ and the upcoming AMF fund will be needed; in order to better shape such a crosscutting policy issue as integration, which relates to both funds. In addition, it is highly necessary to preserve and strengthen Civil Society’s role in the preparation, implementation and evaluation of actions funded by ESF+. Strengthening the Partnership Principle in the funding regulations is represents a positive element in the proposal, and must represent the vehicle for a full and meaningful inclusion of non-governmental civil society as equal stakeholders in the preparation of programmes and in the monitoring committees. Finally, even in those member states that are not keen to allocate resources on migration, it should be possible to support and upscale, though directly managed funding, the local good practices in migrant inclusion, as these initiatives provide an added value both to newcomers and to the local communities.